“Feed a cold, starve a fever” is no longer considered accurate according to recent, medical science research. Food is necessary for a feverish body to replace calories that are being used to fight infection. So let’s “feed” that spring fever with fashionable eyewear must-haves for Spring/Summer 2019! These are not your mother’s (or grandmother’s) clear, plastic glasses. Every tinted hue you can imagine; sleek and ultra-thin to super-chunky; classic to trendy. Tired of plastic? 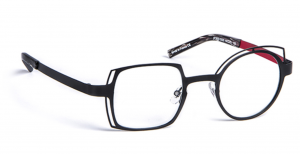 New, metal avant-garde styles; combination plastic with metal details; overlapping frames; clean and simple; lightweight yet durable materials. Don’t be a square, go round! Back with a vengeance in every version of round; John Lennon; Diane Keaton; Harold Lloyd; Harry Potter; Iris Apfel. A single browbar frame is the sleek, hip cousin to a conventional, double browbar design. Styles for women and men; every type of material; so thin that it’s nearly invisible; so thick and shapely that it makes a bold statement. Visit us at American Vision at the Court to shop the latest eyewear trends as well as classic, timeless styles. We love glasses!